Posted 3 January 2014 & filed under 1950s, Life and leisure. There used to be two groups of boy scouts in Sopwell. 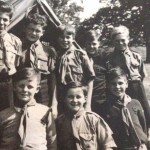 The famous 4th St Albans scout group still exists today and meets in the Jim Green Memorial scout hut between Riverside Road and Old London Road. The scout hut was named after George (Jim) Dymoke Green (known as Jim) a former scoutmaster of the 4th group who was also editor of The Scouter, a forerunner to Scouting magazine, and a Deputy Camp Chief of Hertfordshire. The Rev. 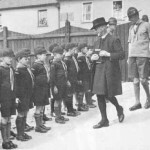 Cassan Horne, Curate of St Peter’s Church, started the 4th St Albans scout troop on 12 August 1909. 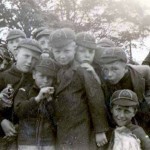 The first boys were recruited mainly from his Sunday school and had been meeting previously as “The Monkey Patrol” in an area near Green Lane. They were led by Billy Wren. Having watched the boys over a period of time the Rev. Horne decided that he would become a leader and set up the Fourth St Albans. The boys enrolled that night were, Frank Brown, Henry Tebboth, William Barker, Frank Woods, Sidney Green, Horace Allen, John Boot, William Munt, Harry Hardy, Frederick G. Wilks, Thomas H. Molyneux and Frederick Eaton. They were joined on 17 September by Arthur Smith, Charles Daniels, Stanley Andrews, Chris Penfold and William Paul. The boys chose as their troop motto – “Nulli Secundus”, which translated means “Second to None” and has remained its motto to the present day. When Rev Horne retired his place was taken by Charles Dymoke-Green. His son Jim (Jim Green) took over the group but he unfortunately died very young aged 27 in 1930. On 11 May 1935 the new headquarters of the Fourth St Albans Scout Group was opened and was called the Jim Green Memorial Hut in honour of his memory. The cost of the site and building was £636/1/8d. At the opening ceremony a message was read out from Lord Baden-Powell. The Group centenary in 2009 consisted of a service of celebration in St Peter’s Church. In the grounds of the 4th St Albans HQ, a memorial garden was formed consisting of a walled garden and seat to commemorate the work of Charles Dymoke-Green. This work was carried out by the Hut warden Tom Beardsmore and was opened on 23 September 1951 by Mrs Dymoke Green and many friends attended. This has now been converted to an activity and sensory garden for children in the nursery group that meet there. Once, there also was the 19th St Albans scout group, but that group now no longer exists. When the Cottonmill estate was developed, Doug Wilson from the 9th St Albans group together with Mo Wayman and Derek Cooper decided to start a new group of scouts in the area. Meetings were originally held in the Nissan hut in Abbots Avenue behind St Julian’s church until a site was obtained behind the shops in Abbots Ave on land between Wallingford Walk and Trumpington Drive. Doug Wilson was the first Scoutmaster of the 19th and the Cubmaster was Derek Cooper. The group built themselves a scout hut. Henry Notley recalls that he and Charles Toogood were ‘about to nail the last floorboards down- only to find that Cub Freeman was still underneath! A more painful memory I have is that of falling between the joists and fracturing my ribs!’ […always a scout! A glimpse into St Albans scouting since 1908, edited by Bob Peatling and Bernard Smith]. The hut was opened by the Mayor in 1954. 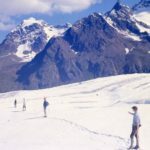 Harry Brampton has memories of trips taken by the 19th scout group in the early sixties: “For the trip to Austria the group travelled by train to Folkestone via London, then ferry and then train to Basel in Switzerland and train to Imst in Austria. It took a long while. The seats on the French train were wooden slats and we shared a large bottle of French cider on the way back! We travelled around Austria in the Post buses and then hiked up into the Alps. We stopped at huts in the Alps that were run by the Austrian Alpine club. Which we had to join. I still have my club badge! There were other outings to Scotland across the Cairngorms from Braemar to Aviemore via a rock called Shelter Stone. We had to keep all our food in tins to protect it from the rats! All our cooking was done on Primus Stoves because although gas was available it didn’t work at high altitudes. Again this trip was train travel. It was very slow as most of the trains were still steam including those in Europe. I am sure that Jack Smith organised these expeditions. I think Jack was the leader of the Rover Scouts of which we were all members. Meetings of the 19th scout group were well organised. I do remember that at the end of the evening the hut was always tidied up and the floor swept. This caused huge amounts of dust so all the doors” Two photos of the Austrian trip are included below. The group thrived for several years but eventually suffered from a lack of willing helpers and folded in 2004/5. The hut has since been pulled down. 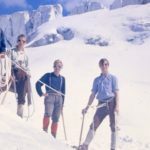 19th Scout group on holiday in Austria early 1960s. George Wilks – blue shirt with braces, Geoff Stone – red hat. Member of 19th St Albans 1962-1970, Patrol Leader of Rhino Patrol, Don Stone was Scout Leader. I was in the 19 th from 1960 to 1966 I was in panther with harry brampton as leader. I remember Don stone, tony prior,and jack smith (senior scouts) I went on to be a rover scout. I used to look forward to scout night. Shame its gone, I live in wellingborough now, and sometimes go back, my goodness what have they done to. Snorbans. Kind regards Colin smith…. I was a member of the 19 scouts throughout the late 60’s early 70’s. I remember the Stones running it, father and son, Dennis I believe. I also remember the Taylor family running bingo there as well. I was a member of a scout group in Vesta Ave during the war, we used to meet in one of the empty shops at the time. I can remember going on a camping trip somewhere, it couldn’t have been too far as we walked there pulling the cart and I took my bike as I had to go to work in a butchers shop in London Rd. on the Saturday morning.